Computers & Graphics has an open access mirror journal Computers & Graphics: X, sharing the same aims and scope, editorial team, submission system and rigorous peer review. 1. Research and applications of interactive computer graphics. We are particularly interested in novel interaction techniques and applications of CG to problem domains. 2. State-of-the-art papers on late-breaking, cutting-edge research on CG. 3. Information on innovative uses of graphics principles and technologies. 4. Tutorial papers on both teaching CG principles and innovative uses of CG in education. Computers & Graphics provides a medium to communicate information concerning interactive CG and CG applications. 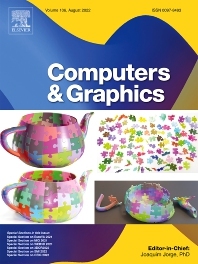 The journal focuses on interactive computer graphics, visualization and novel input modalities including virtual environments, and, within this scope, on graphical models, data structures, languages, picture manipulation algorithms and related software.